CKD Galbraith, has launched a well-known and compact mixed farm on the Carse of Stirling to the open market. East Moss-Side Farm is an attractive mixed unit located in a delightful rural setting near the popular village of Thornhill. This is a highly desirable holding which offers comfortable living accommodation together with a useful range of modern and traditional buildings and approximately 95.61 Ha (236.25 Acres) of land, available for sale as a whole or in two separate lots. The majority of the farmland is utilised under a typical Carse of Stirling crop rotation with a mix of barley, wheat and oats grown along with Timothy hay, which is widely regarded as being the very best in the UK. All of the land lies at approximately 15m above sea level and is generally level in aspect. The land is primarily classified as Grade 3.2 by the Hames Hutton Institute, however a section of land forms part of the Flanders Moss which is a Site of Special Scientific Interest (SSSI) and has been classified as Grade 5. The farmhouse is located within close proximity to the range of modern and traditional farm buildings with a number of the traditional buildings forming a U-shaped' courtyard which, subject to necessary planning consents, may present an opportunity for development or extension to the existing dwelling. The farm also includes three pole barns of various sizes and a steel portal framed cattle shed (18mx18m) .The farmhouse, which is located on the northern edge of the property, takes full advantage of the stunning outlooks and surrounding countryside, with views of the Gargunnock Hills to the south and the Trossachs and Ben Ledi to the North West. Stirling is situated only 10 miles to the east and offers an excellent range of amenities and services. There is a highly regarded primary school in Thornhill with secondary schooling at McLaren High School in nearby Callander. The scenic Loch Lomond and Trossachs National Park is literally on the doorstep, within a 15minute drive of the property, offering famous scenery and a plethora of recreational and leisure opportunities. 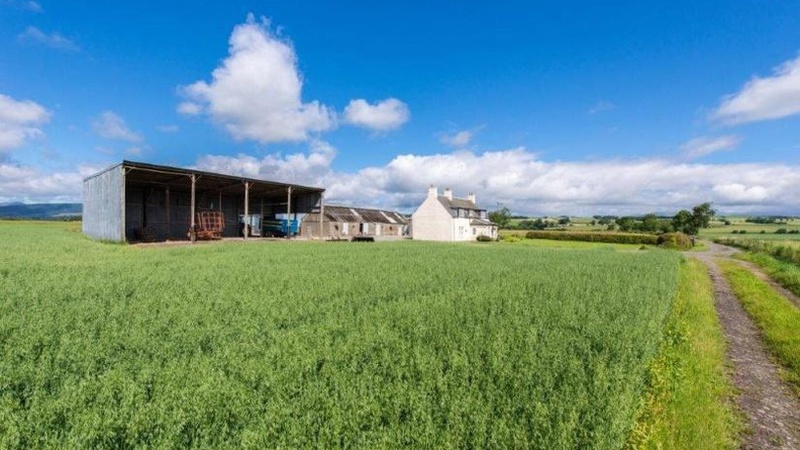 East Moss-Side Farm offers a fantastic investment and lifestyle opportunity as it comes to the Stirlingshire market as a whole or in two separate lots. The farm has been well maintained and looked after over the years and would allow for the seamless transition of new owners to take over at the helm. The farmhouse at East Moss-Side offers a fantastic family home in a truly beautiful rural location.